Buzzes of excitement have become apparent in family history societies over the last few years, as more and more genealogists are starting to use DNA testing as a part of their family history research. For genealogical purposes, there are three main types of DNA tests that are available: Y-chromosome (Y-DNA) tests for the direct paternal line, mitochondrial DNA (mtDNA) tests for the direct maternal line, and autosomal DNA (atDNA) tests for finding matches on all your ancestral lines. Once you've decided to test your DNA as a part of your family history research, and which person to test and which test type, the next consideration is which DNA testing company to use. Those new to DNA testing for genealogy will soon become aware of GEDmatch. Common questions asked in genetic genealogy groups once a member receives their autosomal DNA results include: "How do I upload my raw data to GEDmatch? ", "How do I use GEDmatch once I have uploaded? ", and "What does it all mean?". When there are sales, offers or discount voucher codes available for the purchase of DNA tests for genealogy and associated products or subscriptions, I share them here. Current DNA test prices are at an all time low, so it is a great time to start your DNA journey! Should I test my siblings too? This is a question often asked and heard in the genetic genealogy community. Should I test my siblings too? The answer depends on the type of DNA test and the makeup of your family. Beginners to DNA testing for genealogy often ask how they can educate themselves to more easily understand the terminology, the science, the testing products and their DNA results. Family reunion stories in the media have always been very popular. Just a few years ago many of the stories below - all resulting from DNA testing - would have been unheard of, perhaps even thought impossible. Thousands of genealogists have tested their DNA for family history purposes, but from my experience it seems that many are not members of DNA Interest Groups (DIGs) or even family history societies - they are going it alone, or getting their support entirely online. When you test your autosomal DNA, your X-DNA is also examined and included in your raw data &/or match results. When you match someone on your autosomal DNA and also share segments on the X-chromosome, the unique inheritance pattern of X-chromosomes can help isolate your common ancestor to particular lines of your ancestry. Should you upgrade your Family Finder transfer? Family Tree DNA's Autosomal Transfer Program is a very popular method of getting your DNA into the Family Finder database. Why wouldn't it be? It is free, quick and easy! When I have transferred AncestryDNA raw data files into FTDNA, I have been able to access the match results very quickly. 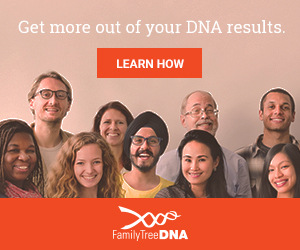 Once you start taking an interest in DNA testing for family history purposes, you will naturally want to find out more about how everything works - the test types, who to test, choice of testing companies, understanding results, taking it further, support groups, online forums, advanced tools, projects, etc. What is a Family Finder test? What does a FTDNA test kit look like & how do I use it? Rev up your research with DNA!